By Sam Smith | 11.16.2015 | 10:10 p.m. The Bulls Monday survived the Indiana Pacers in a 96-95 victory as Jimmy Butler blocked a Paul George fading jump shot at the buzzer to save the victory. The Bulls moved to 7-3 and will play in Phoenix Wednesday. Butler finished with 17 points as he fought foul trouble with five and Pacers star George down the stretch. Derrick Rose led the Bulls with 23 points and six assists and made both his three-point attempts. But Rose had to leave the game midway through the fourth quarter after sustaining an ankle sprain on a drive to the basket. Doug McDermott added 11 points and Taj Gibson was all over with nine points, 11 rebounds, five assists and four blocks. George led Indiana with 26 and Monta Ellis had 20. The Bulls had double digit leads in each of the first three quarters. But the Pacers behind George and C.J. Miles’ three-point shooting kept coming back. The Pacers finally tied it at 93 with 2:40 left. Pau Gasol then made one of two free throws and Butler hit a tough driving pull up in the lane for a 96-93 lead with just over a minute left and the Bulls survived down the stretch. In coach Fred Hoiberg’s ever changing lineup musical introductions, Tony Snell was back in the starting lineup against the smaller, quicker Pacers lineup. But it was the Bulls who were speedier to begin behind the shooting of Rose, who had a banker, a drive and a three as the Bulls sped to a 16-5 lead. The second group led by McDermott’s shooting and Gibson’s hustle and all around play then helped the Bulls to a 31-21 lead after one. The Bulls kept threatening to pull away, ahead 41-28 and then 48-35. But the Bulls’ lost Miles for back to back threes as the Pacers scored eight straight to trail 53-45 at halftime. Rose had 11 in the first half as all 10 Bulls scored while Miles and Paul George had 12 each. The Bulls again surged ahead behind Rose and Butler to take a 67-52 lead midway through the third quarter. But again the Bulls forgot about Miles, were on the way to missing 10 free throws through three quarters and reverted back to isolation offense. The result was the Bulls holding onto a 79-75 lead entering the fourth quarter. 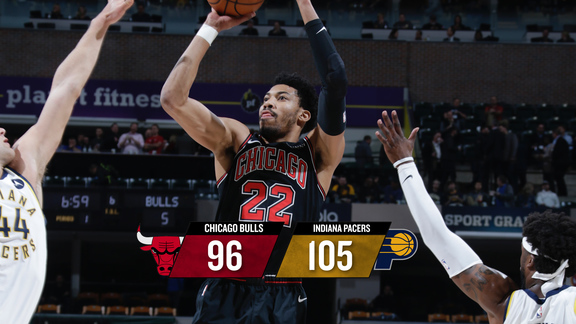 Rose then sprained his ankle on a drive to he basket and left for the locker room late in the game after the Bulls led 89-84 when he first suffered the sprain and the Pacers went on to tie the game at 93 with 2:40 remaining but never could get the lead.